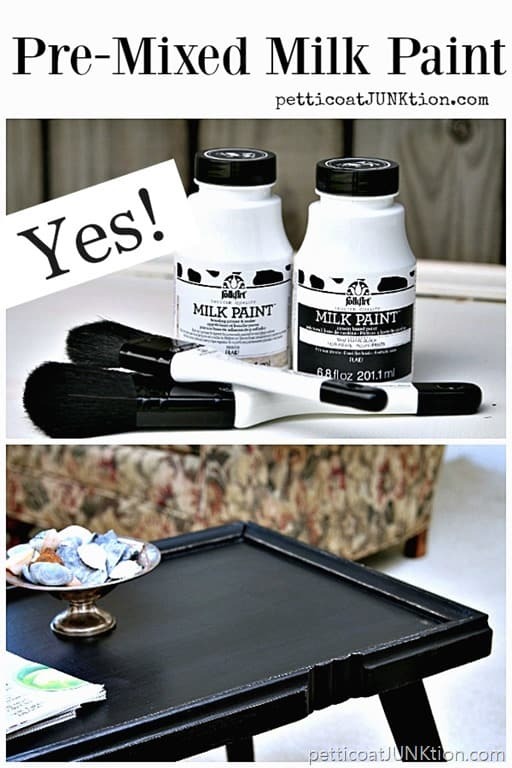 For this milk paint furniture makeover I didn’t have to mix a thing. Gotta love that. I like milk paint a lot but we all know mixing it up can be a pain. I’m really excited about today’s painted furniture project! You guys remember when I went to Plaid Headquarters and worked with new products being introduced this year. 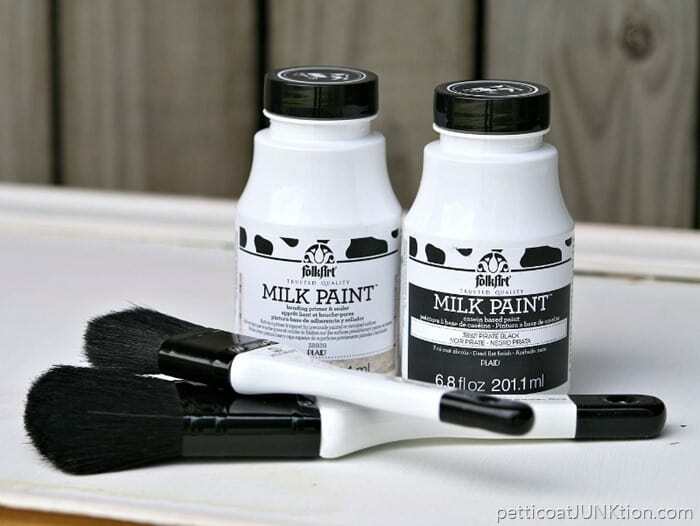 Well, this project features FolkArt® Milk Paint. The paint will be available in stores this month….maybe already in a store near you! 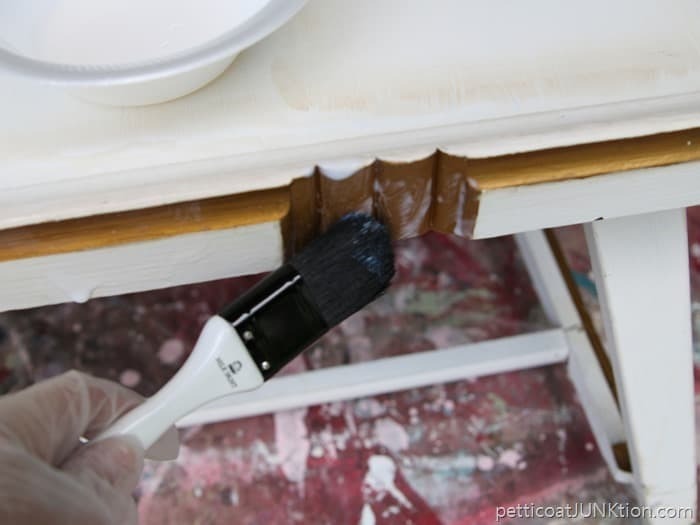 I fell in love with the paint…no mixing, no fuss. The table hubby (also known as The JTS, Junktion Technical Specialist) bought at an auction needed a makeover in the worst way. I like the size of the table and decided it would be a good replacement for the trunk/coffee table in our living room. The trunk really doesn’t fit the décor in our small living room. I selected Pirate Black for the table makeover. 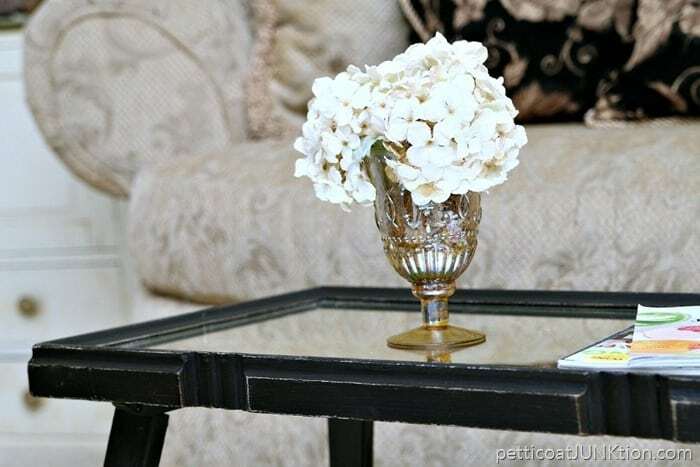 There are black framed photos hanging above the sofa and decorative black print pillows on the sofa so extending the color to the table would be perfect. 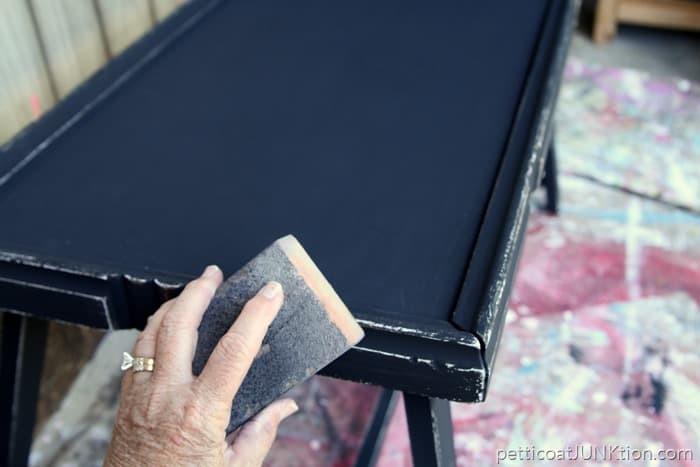 I started by priming the table with the FolkArt® Milk Paint Bonding Primer & Sealer. The primer goes on white and dries clear. 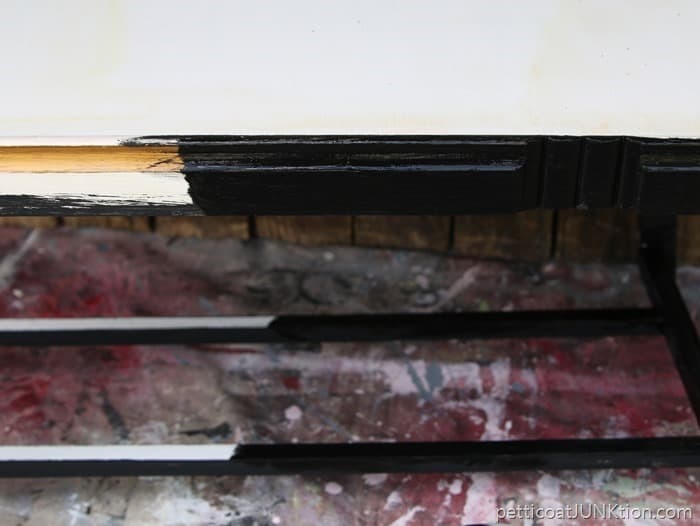 I waited the recommended dry time for the primer ( 4 hours ) and began applying the milk paint. I used the FolkArt Milk Paint brush and the paint went on nice and smooth. The milk paint is thin and I really thought I would have to use several coats to cover the white paint. Boy was I wrong. 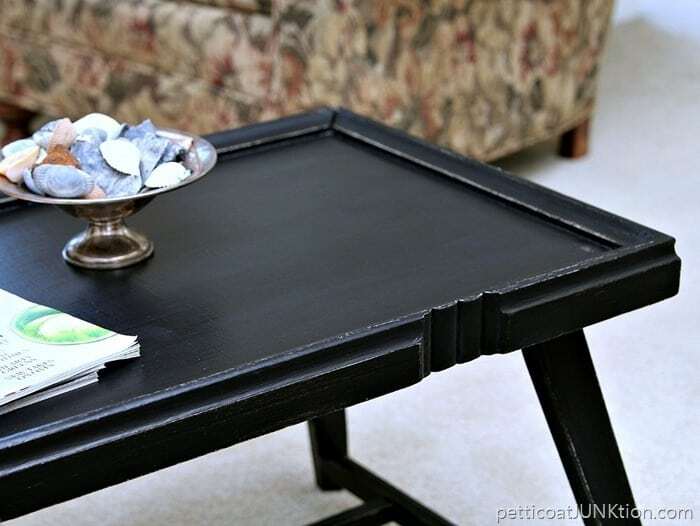 This photo shows the table with one coat of black milk paint. I applied one more light coat of paint primarily to cover the leg joints I missed the first go-round. Since our sofa is off-white I thought it would be nice for a bit of the original white paint to peek through under the black. I distressed all edges and details lightly with a sanding block. After sanding I wiped the table with a dry cloth then applied the Bonding Primer And Sealer. The sealer darkens the paint slightly and adds just a bit of satin sheen. 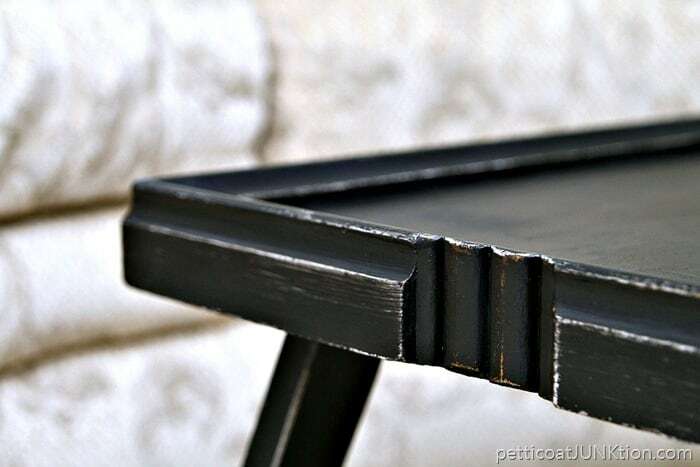 The milk paint is flat black and doesn’t require sealing…just an option. The milk paint doesn’t chip or peel. It distresses perfectly. 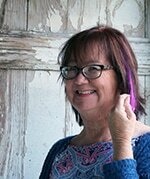 Of course, it doesn’t have to be distressed but you guys know me….aka…..the “Queen of Distressing”. I like the fact that it’s pre-mixed. What a great idea! It’s a time saver and money saver. No lumps in the paint and the paint won’t spoil. When I posted about the auction table we discussed mirror topped tables. I got some yeas and some nays. I was leaning toward nay but the black paint really showcases the mirror, or maybe the mirror shows off the black paint? Either way I like the look of the mirror. Our living room is the least used room in the house and it’s a little more formal so the mirror and black paint works. Our den is large and really casual and that’s where we hang out most days. 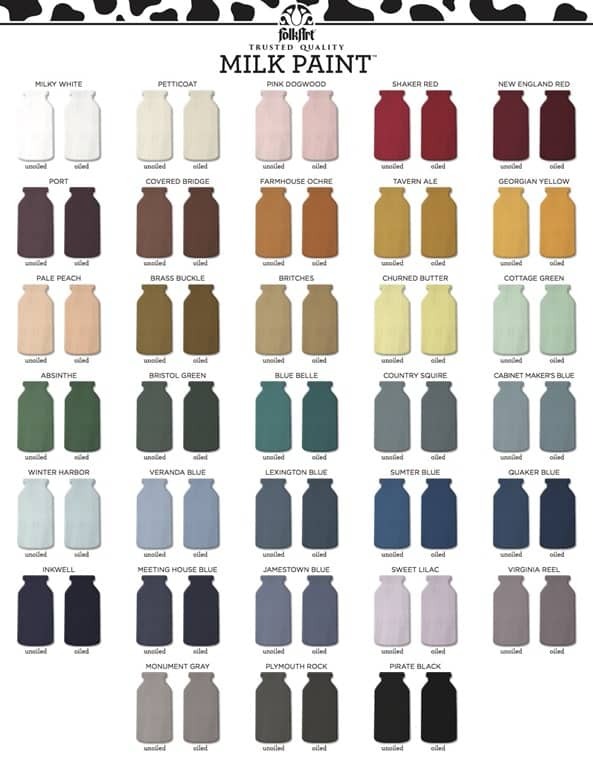 The milk paint comes in 33 colors and they can be combined to make custom colors. Not that I would ever mix colors, hahahahaha. How do you like the table now? Much better, huh? Keep an eye out for the paint in your local stores. 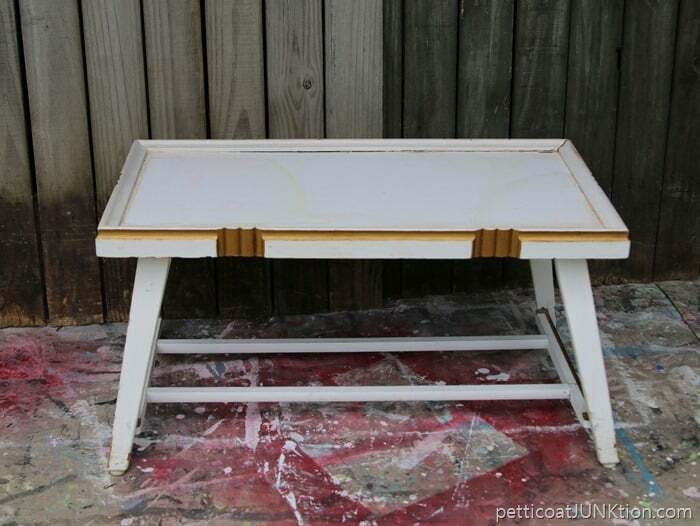 I just painted another table with the milk paint and it’s a doozy….stenciled it too. 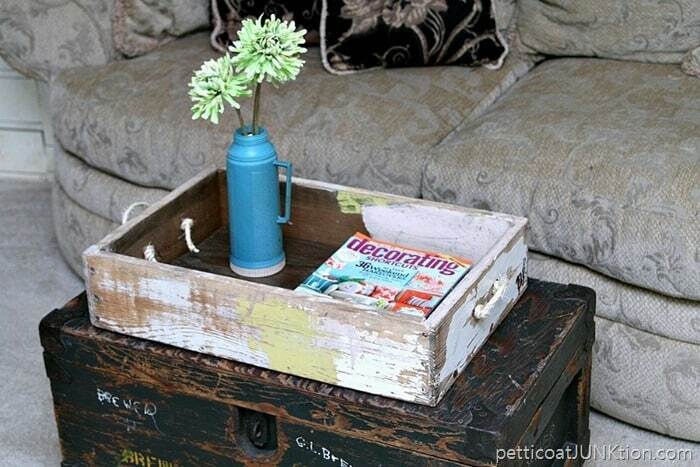 You can see it here……Inkwell Color Milk Paint Table. Read more about the FolkArt Milk Paint on the Plaid On-Line Website. Disclosure: I partnered with Plaid Crafts on this post. All words, ideas and photographs are 100% my own. See you guys tomorrow. Have a great day. Wow! The new table looks great. Thank you for sharing at Merry Monday! 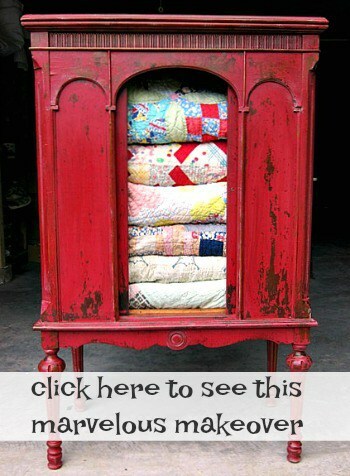 Such a fabulous upcycle! Wow! I vote for keeping the mirror! I love it with the mirror! Awesome job Kathy! I love it! It turned out really beautiful. 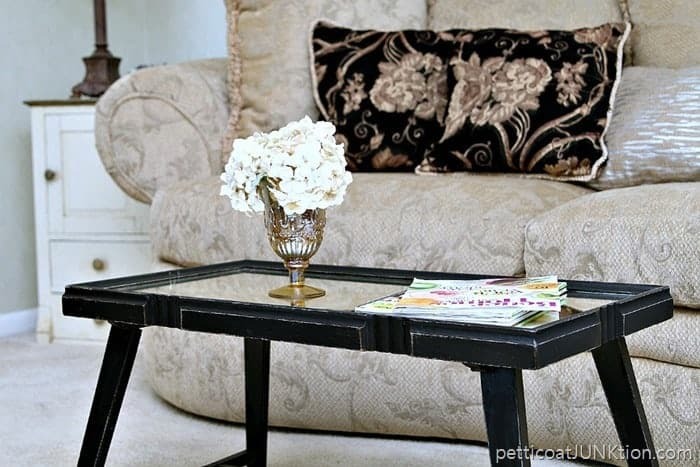 It really complements your decor, and you can’t go wrong with classic black! I like the mirror top too! 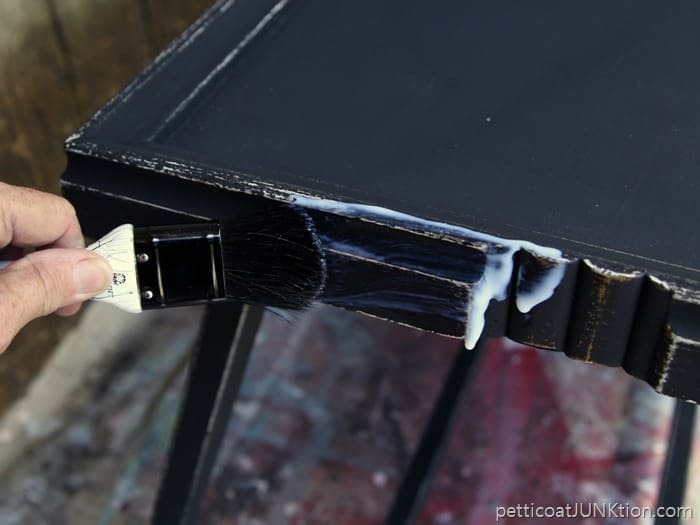 The table looks great and love the idea of pre-mixed milk paint! Nice makeover, Kathy! I’ll definitely keep me eyes open for this paint. I like that it’s premixed. Love it! You have me itching to do some refinishing! Cathy–I get a little confused about when/where to use these paints. 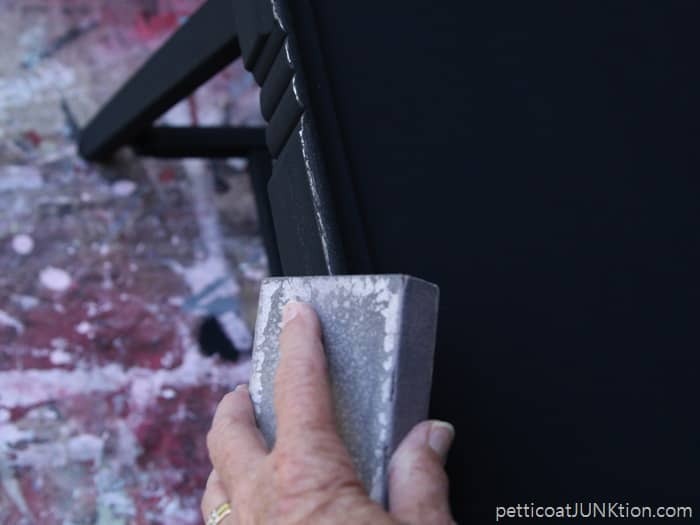 What is the difference between this and chalk in terms of finish, durability, etc? I’d love to see a comparison of all the various finishes/paints: pluses, minuses, etc. Impressive! Definitely on my must-try list now! Thanks for sharing. Well this is fun! Kathy, do you know if the paint would chip like other casein milk paint if you hadn’t started with the bonding primer? Thanks! I didn’t know that , so thanks! I would like to know it will chip, also if no bonding/priming is done. No, this paint will not chip. 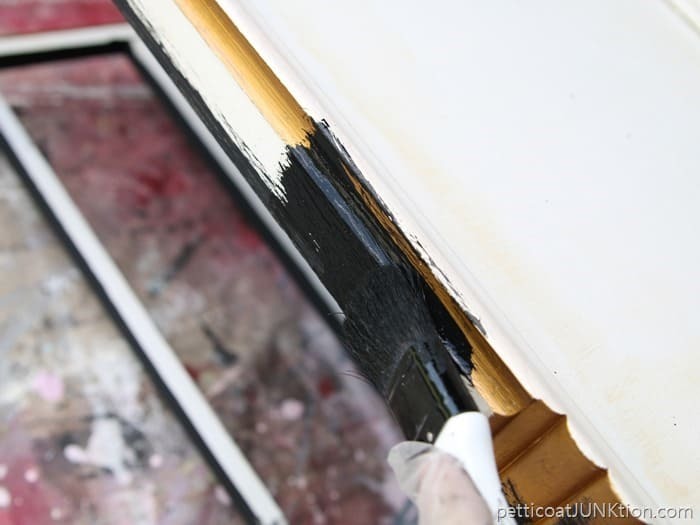 It is recommended to use the bonding agent when using the milk paint over a painted finish. This paint could be a real time saver.